Teacher Karen Magrath and her researcher husband John had lived in their four-bedroom 1960s bungalow in Oxford for sixteen years when they decided to sell and move to a smaller property. With Karen approaching retirement, the couple still had a mortgage on their home and wanted to find a way to become more financially secure when one of them stopped working. “The aim was to sell and downsize” said Karen “so that I could retire as planned without the worry of a mortgage”. The bungalow was in a glorious position on top of Yarnells Hill, a highly desirable area overlooking the dreaming spires of Oxford and the rolling countryside for miles around. Local estate agents Chancellors valued it at £650,000 and everyone anticipated a quick sale for the lovely family home. Six months later and having dropped the price by £50,000, the house refused to budge. There was a problem. Almost in despair with their sloping, unsellable home, the Magraths were introduced to property planning consultancy Albright Dene. Managing director Joe McDermott, an expert in appraising difficult sites, came up with a plan. He proposed a clever design involving demolition of the bungalow and major excavation of the site to create a sweeping driveway to a new development of eight new luxury apartments. 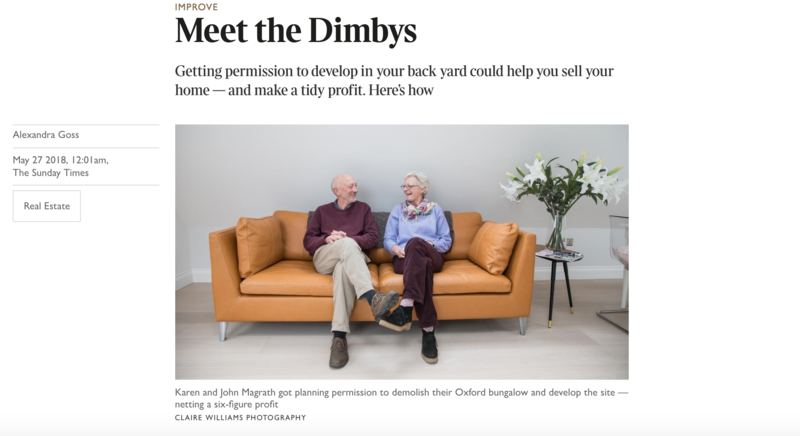 With planning consent, this would make the couple’s property worth significantly more than its original valuation – and Oxford would acquire much needed new housing. Unsure about the prospect of spending their own money on what seemed like a speculative planning process, the Magraths agreed to let Albright Dene lead and finance the entire planning application themselves. With no risk to the couple, the deal meant that both parties would share in the gains delivered by the planning consent, if it was successful. All they had to do was take the bungalow off the market and allow Joe and his team to get on with the planning process. Eighteen months later and with the planning consent achieved, the site was sold for over 40% more than its earlier asking price – a substantial profit which was then split between Albright Dene and the Magraths. “At first we were wary of teaming up with a ‘developer’, but planning consultancy is something quite different.” Said Karen “I would encourage anyone to consider this way of increasing the value of their home – especially if it’s on a tricky site like ours was or if it’s taking a long time to sell”. And what difference has the experience made to Karen and her husband?